To One So Sweet Stay That Way: Hank Mobley In Holland reveals a tenor saxophonist who may not display the kind of brilliance of his golden years in the late fifties and early sixties, but nevertheless remains a singular class act, especially in, surprise, a big band context. Expert jazz sleuthing. The Dutch Jazz Archive unearthed ten live and studio cuts from the quintessential hard bop tenorist’s sojourn in the Netherlands in 1968. I think to myself, what a wonderful hard bop world! Mobley was a heroin addict and when he was kicking the habit resorted to booze. The classic pit fall in an all too typical jazz tragedy. Convicted twice, risking a long prison sentence due to the American three-strikes-and-you’re-out-system, Mobley had good reason to bug out for the dug out. What better way than to cross the great pond. Contrary to belief, Mobley arrived in The Netherlands instead of the U.K., touring France afterwards, where he recorded The Flip, and, subsequently, the U.K. and Denmark. The package of the CD includes great photographs and detailed liner notes including memories of collaborators pianist Rob Agerbeek and bass player Ruud Jacobs. Mobley played live with Agerbeek’s one-off trio in Rotterdam’s club B14 on March 29, with the Pim Jacobs Trio including Ruud Jacobs and guitarist Wim Overgaauw at the Bellevue Theatre on March 20, and, another studio session, with the Hobby Orkest on March 28, an orchestra of Dutch luminaries that gathered irregularly, including Dutch bop veterans and talents Piet Noordijk, Ferdinand Povel and Frans Elsen. In his indispensable book on the sidemen of Art Blakey’s Jazz Messengers, Hard Bop Academy, Alan Goldsher offers a hip baseball analogy to illustrate the brilliance of Hank Mobley, labeling him as a five-tool player, a rare breed of all-round excellence. Mobley ‘had killer chops. He had a silky tone. He could tell the hell out of a story. He was a smokin’ composer. And he could swing you into the ground. Five tools. Six, if you count the fact that he looked great on a record cover.’ How true. Mobley’s a legend that carved out a niche during the era of the towering giants Sonny Rollins and John Coltrane. The ultimate ‘musician’s musician’ – Leonard Feather’s famous appreciation of Mobley as ‘the middleweight champion of the tenor saxophone’ stems from 1960 – Mobley’s unspectacular style, unassuming personality and the fact that he never led a stable outfit perhaps prevented widespread public recognition. By 1968, media coverage of the ‘new thing’ and stars like Miles Davis overpowered attention for a more conventional player like Mobley. Short on publicity but a saint for European mainstream jazz aficionados. Sound and style-wise, Mobley’s tone, still relatively soft and, as Mobley himself defined it, ’round’, had more bite to it, while his slightly dragging beat and relaxed phrasing are ever-present. Mobley retained a good portion of his innate sense of logic and continuity but at the same time concentrated on staccato lines and had shopped at John Coltrane’s store of harmonic finesse. No summer sale there, top quality stuff all-year round. In the live setting of club B14, Mobley also focuses on suspenseful chopped lines, but simultaneously on all-too drastic twists, turns and ad-libs, therefore drifting away from a long-lined, coherent tale. He sounds a bit fatigued. The discovery of the tapes from club B14 is a blessing, but one has to ‘read through the lines’ of the rather inferior sound quality. In general, Rob Agerbeek has the upper hand, expertly mixing modern jazz with the traditional legacy of blues and boogie-woogie in Miles Davis’ Veird Blues and Mobley’s Three-Way Split, which is the liveliest tune of the performance. On the other hand, Mobley’s work in the studio on March 20, the day Mobley stepped out of the airplane with a probable jet lag, is focused and marked by Mobley’s unique sense of rhythm and suave phrasing. The Pim Jacobs Trio is excellent, the full-bodied, walkin’ bass lines of Ruud Jacobs and Wim Overgaauw’s swift phrasing and delicate clusters of chords in Sonny Rollins’ Airegin are especially imposing. The most surprising features on To One So Sweet are Mobley’s two tunes with the Hobby Orkest, the only known recording of the tenor saxophonist with a big band. The band is lively, the arrangements are smart and Mobley, one of the kings of the hard bop quintet format, is all velvet, sensuality, glowing blocks of wood in the fireplace. Marvelous! Clearly, it’s unfortunate that no one came up with the idea of recording Mobley in a big band setting earlier in his career, nor would afterwards. A swell idea. Like the idea of The Dutch Jazz Archive to prowl public and private vaults for Mobley material, which it acted upon superbly. 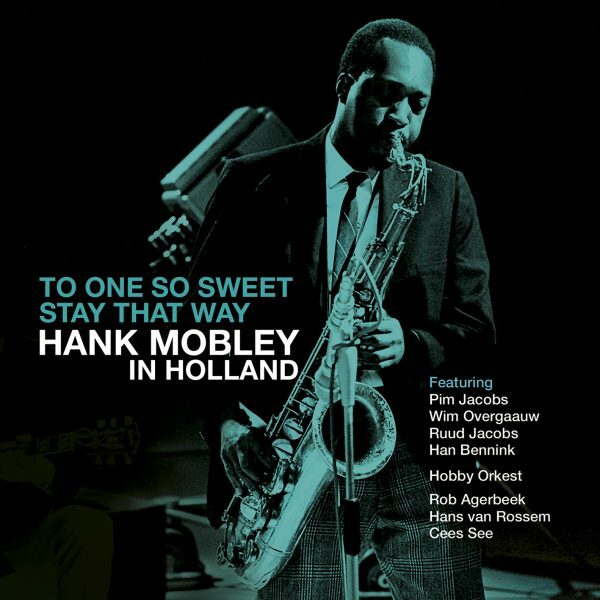 To One So Sweet Stay That Way: Hank Mobley In Holland is the fourth release in the Dutch Jazz Archive’s series Treasures Of Dutch Jazz, following releases of Boy Edgar, Ben Webster and Don Byas. You can order it on the website of The Dutch Jazz Archive here.